Cross Lake Community Council became incorporated Sept 16, 2010 and is now legally named "Incorporated Community of Cross Lake"
The history of Cross Lake has been for as long as the river flows and the trees grow. Cross Lake people origins began some ten thousand years ago before the first Europeans settled in North America. The Cross Lake people's Cree name, which is the people's language, is "Nikickonakos", which means, Otter People. The community, which is now called Cross Lake, Manitoba, is of local of status Indians, Metis and transient people. 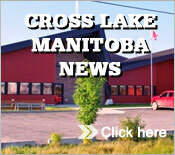 Although the Cross Lake is of cultural differences, the main focus is on the original people the Cross Lake area. The local Metis are of European descent and are closely related to the people of Cross Lake. In fact, as of 1995, 90% of the Metis descendants and families are now status treaty Indians. The Cross Lake is located at the north of the Nelson River where it crosses the lake, hence the name Cross Lake originated from. As early as 1772, the name Pimochickomow, meaning "It lies athwart", was recognized by the early European Settlers. This system has been the route or passage of transportation by inhabitants of this land, the "Nikickonakos" people. It was then used for transportation by the early settlers, primarily by the Hudson Bay Company to trade for furs in exchange for guns and supplies. Thus is became part of the North American fur trade. It has been known for years that Cross Lake was the centre of activities. Before the Europeans came, this marked a place of celebration to end the trapping and hunting harvest. The area of Cross Lake was the centre of commerce and trade. It was the place to meet people and exchange ideas and bond inter-tribal families. The location of the community was within the trading and travelling routes of other Native people - the Swampy Cree as it is historically referred to and termed. Over a hundred years ago, a headsman by the name of Tapastanum was a medicine man and scout. He would come to scout the area for his people, which is now called Wapack, so that there were no signs of warring neighbours of threatening elements. This was customary process that existed and handed down to the chieftains or headsman by their forefathers of the Cross Lake people. It must be remebered the Indian people that existed years ago were of a semi-nomadic nature. Hunting and gathering society meant they lived on the land and travelled where the food was. They had their own customs and laws to keep order of the land. They were natural conservationists and took what they needed and managed their own resources. Their territory extended over northern Manitoba, which represents the Register Trappers Zone. In Chief Tapastanum's days, he would come ahead to scout the area, and his people would come and settle for the summer months in the area now called Wapack. Incidently, the Department of Indian Affairs recognizes Chief Tapastanum because of his strong influenctial leadership skills to rally the people for them. The land was plentiful, the fish was easily harvested, and hunting was good. Cross Lake was, and still is, rich in heritage, tradition and culture.